Differentiated instruction, also called “personalized learning”, addresses the truism that every student learns differently. How they absorb, process, comprehend, and retain information often doesn’t match how their neighbor does. For example, when I teach coding, some students jump in and learn by doing, not getting frustrated by how many times they must debug, retry, and redo. Others start by reading instructions, watching videos, and observing the work of their neighbor. Still others follow a hybrid of both. Learning better when information is presented a certain way has nothing to do with intelligence. Just as someone who can’t see would fail if all instruction were visual, many of us absorb knowledge better when presented in a certain way. 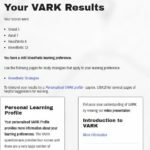 VARK is a learning style inventory. 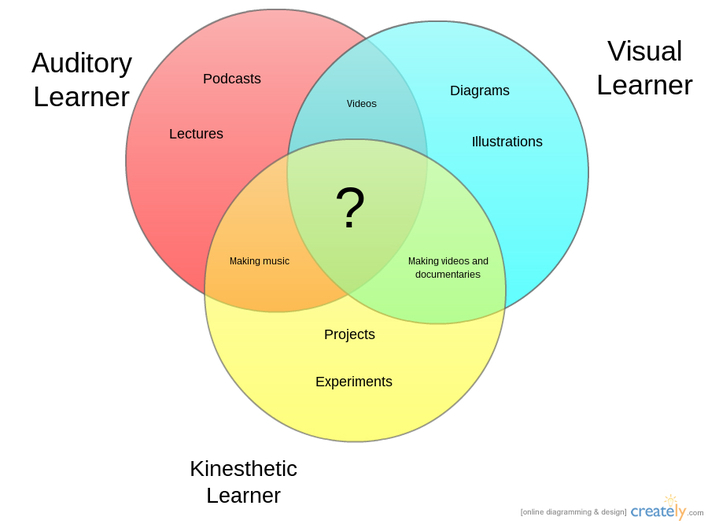 The acronym refers to the four most-common learning styles — Visual, Auditory, Reading/Writing, and Kinesthetics found within educational theorist Neil Fleming’s model of student learning. Visual: information presented as maps, spider diagrams, charts, graphs, flow charts, labeled diagrams, and all the symbolic arrows, circles, hierarchies and other devices that people use to represent what could have been presented in words. Auditory/Aural: a preference for information that is heard or spoken such as lectures, group discussion, radio, email, mobile phones, speaking, web-chat and talking things through. Reading/Writing: information displayed as words, text-based input and output. This includes all forms but especially manuals, reports, essays, and assignments. Kinesthetic: a preference for gathering information through experience and practice, simulated or real, either through concrete personal experiences, examples, practice or simulation. It also includes demonstrations, simulations, videos, and movies, as well as case studies, practice, and applications. The VARK model acknowledges that students process information differently, referred to as “preferred learning modes”. This has a significant impact on the student’s ability to collect and disseminate information and should be matched with appropriate learning strategies. When that is done properly, students show increased ability to comprehend it, use it, and relate it to other knowledge. VARK used to be referred to as VAK until Reading/Writing was highlighted as significantly different from the Visual modality. 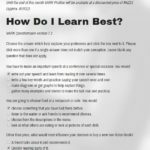 Start with an open-minded assessment of the student’s learning style using the VARK questionnaire or one of several other learning style inventories. The goal is to uncover how the student learns best. 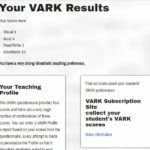 At the end of the VARK questionnaire, students get a report that analyzes their answers and draws conclusions as to what their best learning style is. Students use these results to understand their preferred modality and in a bigger sense, come to terms with why learning challenges they’ve faced in the past have less to do with their intelligence and more with how the knowledge was presented. Follow up this written report with varied activities from all four modalities and pay close attention to the types of intelligence students display as they complete tasks. 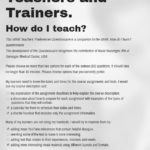 Because often teachers don’t understand how to teach using these different modalities, train faculty to not only recognize these learning preferences among their students but to be open-minded about accepting them and be capable of teaching in all. The idea of individual learning styles is so popular because it makes sense. We see it in action. We notice it in ourselves. Learning-styles theory is endorsed by 93 percent of the public and 76 percent of educators. Teachers understand why students don’t always understand their well-constructed lesson plans. Teachers begin to present materials in multiple ways, accepting that students learn in different ways. Teachers allow students to complete their work in ways that work for them, as long as what they do satisfies lesson goals. When teaching, Gardner recommends two steps: 1) Individualize teaching for students, and 2) pluralize teaching to include as many of the intelligences as possible. When teaching keyboarding, teachers play music so students can pace themselves with the beat. Instead of checklists, teachers use brainstorming and mindmaps to help students organize their ideas. Whole Brain Teaching (WBT) is a multisensory approach to teaching that includes vocal directions mixed with hand gestures, inflections, full body movement, head motions, and chants. It uses “model and repeat” in a fast-paced class that at first blush, visitors would probably call chaotic. Students call it fun. Parents call it effective. Click for more detail. Officially labeled “Orton-Gillingham Multisensory Structured Language Approach”, this teaching style relies on using all the senses — visual, auditory, tactile, and kinesthetic. Where it was first applied to those with reading problems, when O-G was expanded to all classrooms, it excelled. Click here for more detail. Now, after more than a decade of teaching in a manner that addresses student personal learning styles, I can see that the time invested up front quickly paid off in student success. And once I learned to structure lessons that meet students where they learn, it actually saved time in not having to re-explain, provide after-school tutoring, and discuss with them and their parents why they didn’t do well when we all knew they were smart enough. Have you had a similar experience? Or a different one? I’d love to hear from you. 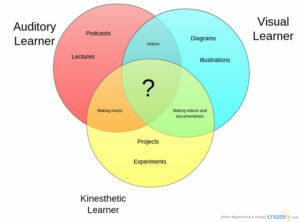 3 Responses to What is the VARK model of Student Learning?